The Michigan Brown Trout Committee along with various partners in the community has spent thousands of dollars attempting to reestablish the dwindling brown trout population in Northern Michigan. Unfortunately reports have been coming in that people have recently been taking unfair advantage of the restocking. 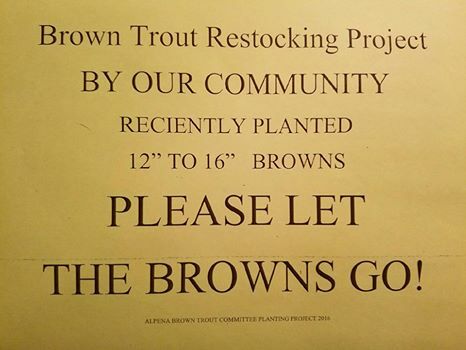 The Michigan Brown Trout Committee says that some people have been fishing out these recently planted brown trout by the quote bucket full. The group is urging people to not exceed the legal limit and asks if anyone sees anything suspicious or taking advantage of the plant to contact your local DNR office. The browns that were planted are 12 to 16 inches in length. They want to remind residents that small browns now, will mean big browns on the leader board come July.